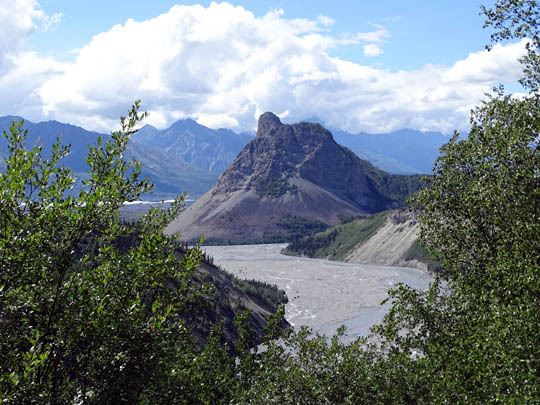 Mountains to the south and visible from scenic viewpoints near the highway." 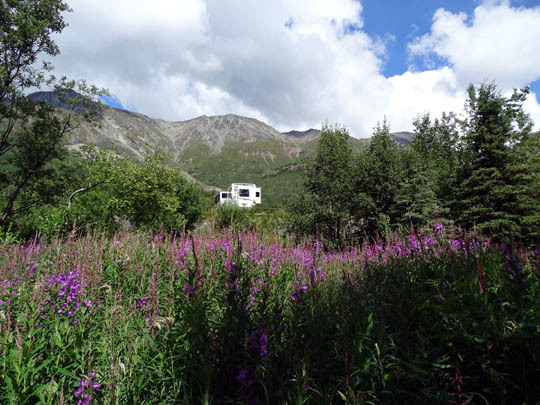 We have traveled west on the Glenn Highway twice now from Valdez to Anchorage, in 2012 and again this summer. This is the first time we've driven east on the highway. 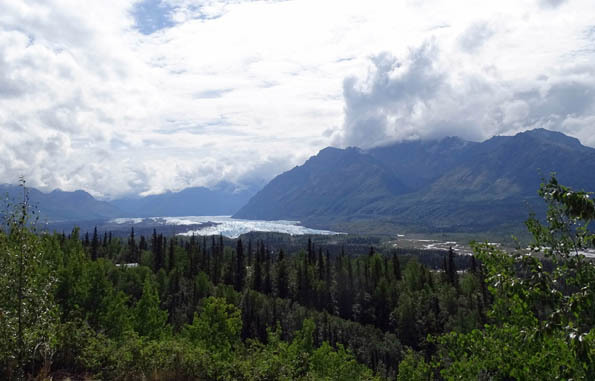 Matanuska Glacier and River from a high spot on the Glenn Hwy. 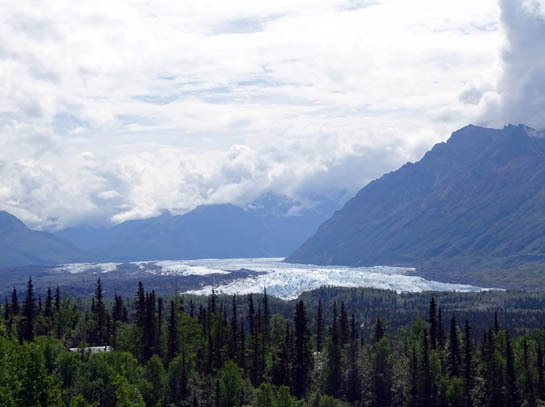 Even though we were facing the sun this morning I was able to get a few decent photos of the glacier and river from the passenger seat, pictures I wasn't able to get when going the other direction. 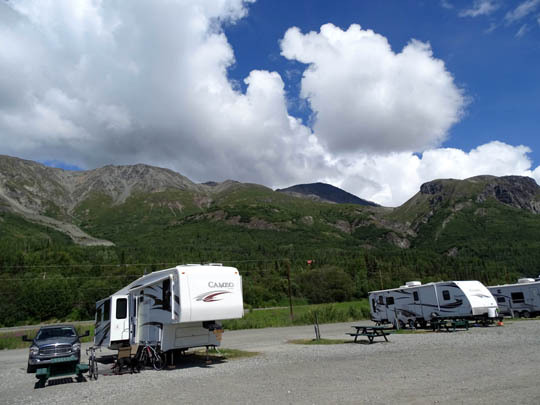 We'll be spending the next three nights at the Grand View RV Park at MP 110 on the Glenn Hwy. 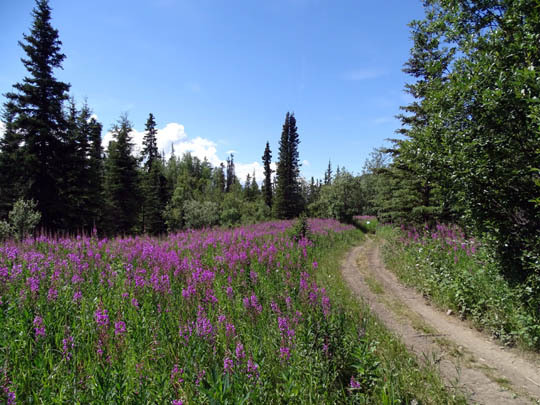 near Sheep Mountain, the start/finish of Jim's ride in the Fireweed 400 bike race tomorrow. 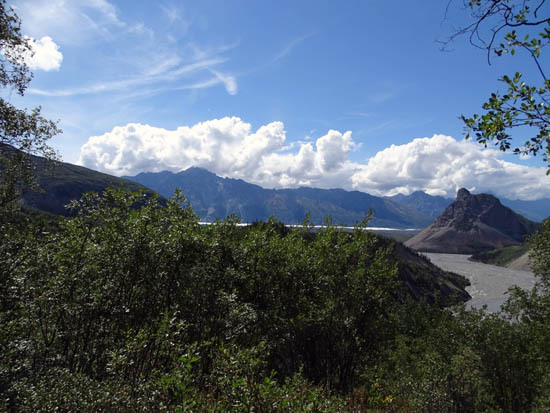 This entry covers the scenic drive to the campground, information about the RV park itself, and views of the Matanuska River and Glacier from the road and a trail behind the campground. 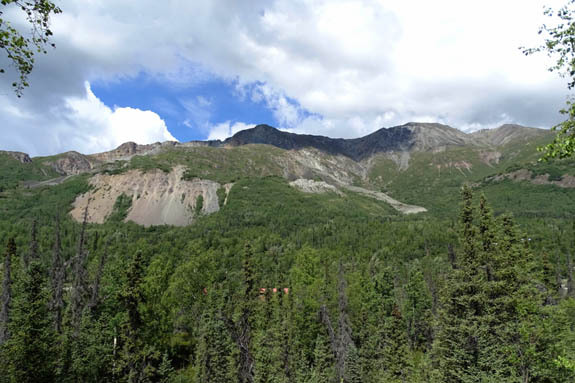 This morning we drove north and east for 98 miles from Black Spruce Campground at Joint Base Elmendorf-Richardson in northern Anchorage along the Glenn Hwy. 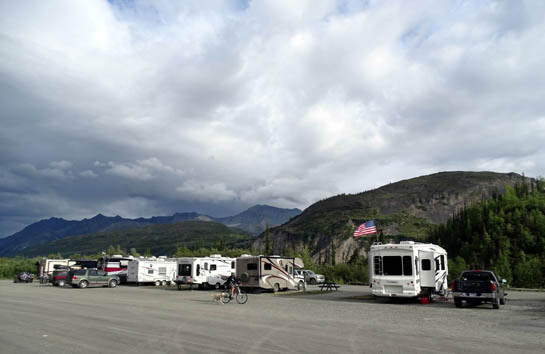 to Grand View RV Park. 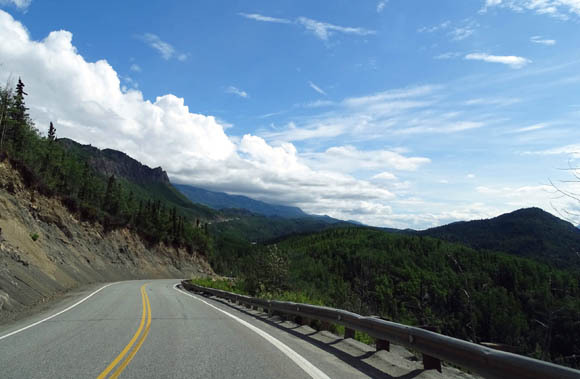 It's a beautiful drive, especially east of Palmer. 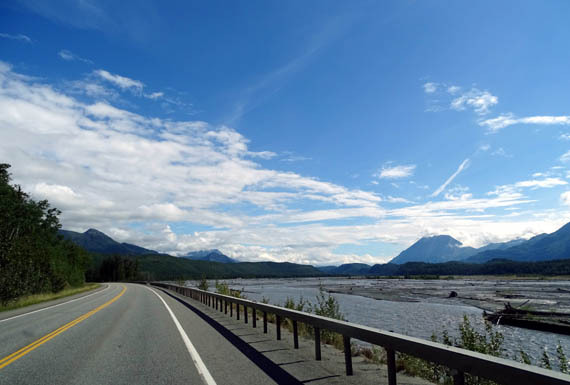 The roadway lies close to the Matanuska River for several miles, then winds high above the river and glacier the rest of the way to Sheep Mountain. 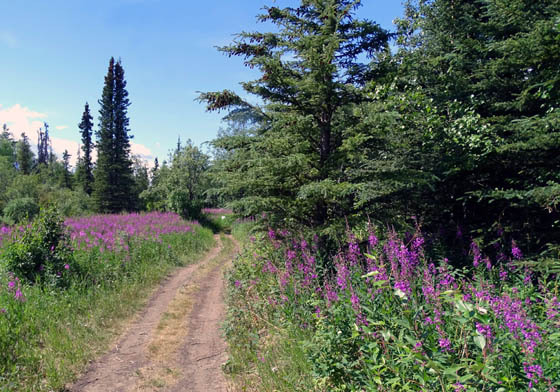 There were lots of fireweeds and other wildflowers blooming along the roadway. 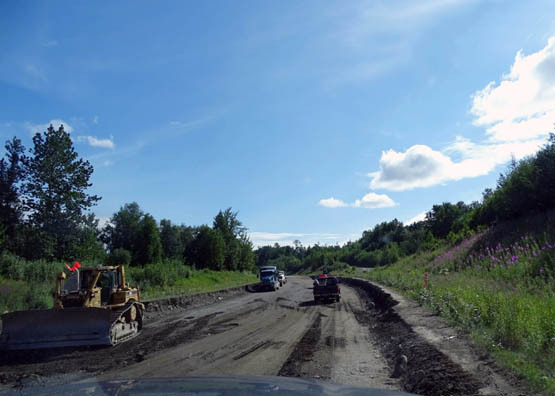 The rest of the construction area had just been repaved and was very smooth, as was the pavement the remainder of the way to Grand View. After heavy winter snows and/or spring rains the roadway sometimes floods this close to the river. 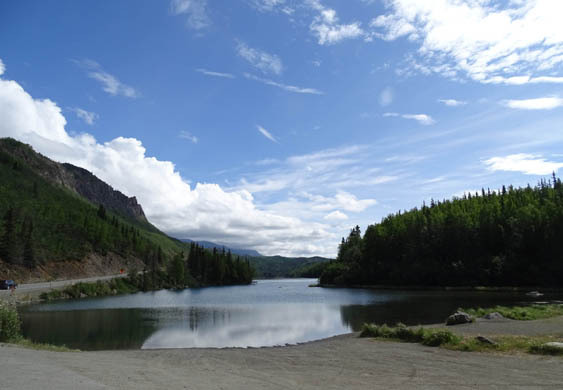 Scenic pulloff by Long Lake on the Glenn Hwy. 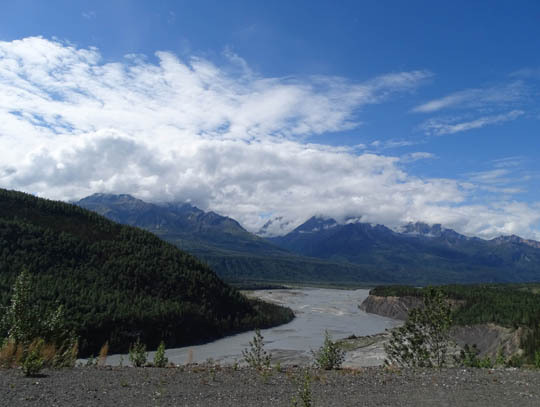 Cement-colored water in Puritan Creek flows into the Matanuska River a little farther downstream. 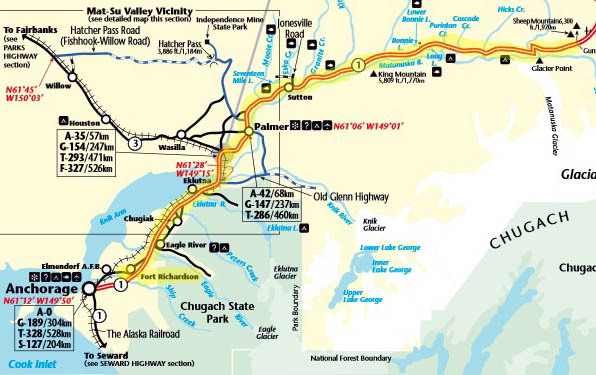 Traffic was moderately heavy between Anchorage and Palmer, then lighter the rest of the way east. We stopped a couple times at overlooks but made good time despite photo ops and road construction, arriving at the RV park about noon. 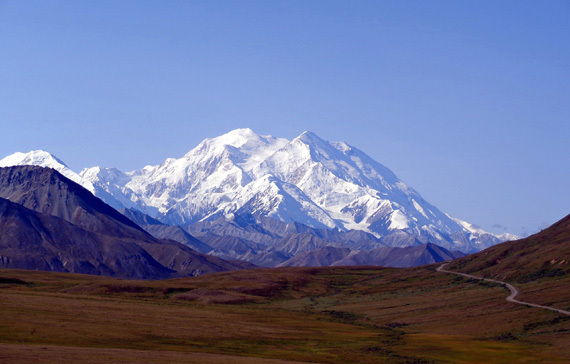 This is a nice place situated on a high pass with great views of mountains on either side of us. 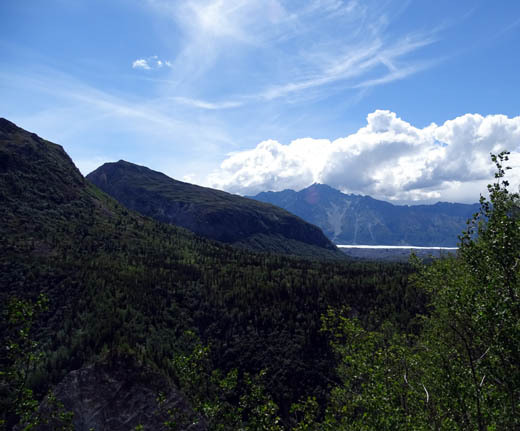 "Grand View" is aptly named! 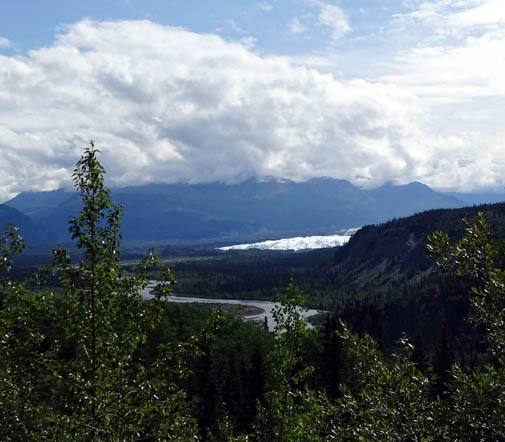 An added bonus is a trail from the campground leading to a bluff that overlooks the Matanuska Glacier, Caribou Creek drainage, and Lion's Head, an ancient volcano. That's us with the flag. 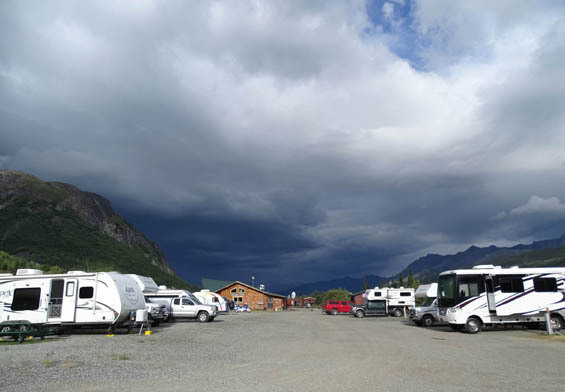 The sites in this RV park are very close together so we were glad no one was right next to us for two of the three nights we were here. When we made our reservation several months ago we specifically asked for this site so we'd have more room. 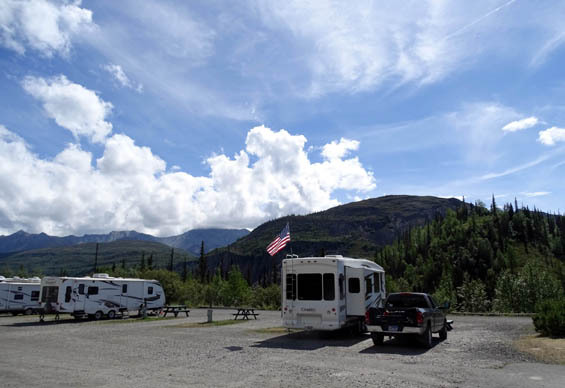 We usually look at campgrounds on Google Earth before making reservations so we can see how close the sites are and where they are located. Our cost per night is $38+ with military or Good Sam discount = a good deal compared to JBER, which has gone up to $33. On the other side of the building there are nine other pull-thru sites and seven back-in sites with partial hookups, plus a few tent sites. 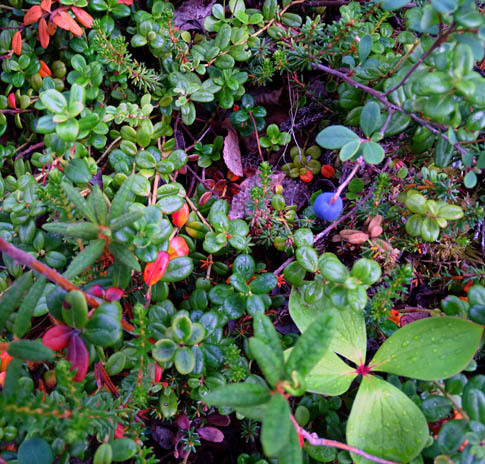 All the sites are on gravel; some have grass between them. Above and below: Jim and Casey ride/run through the campground. 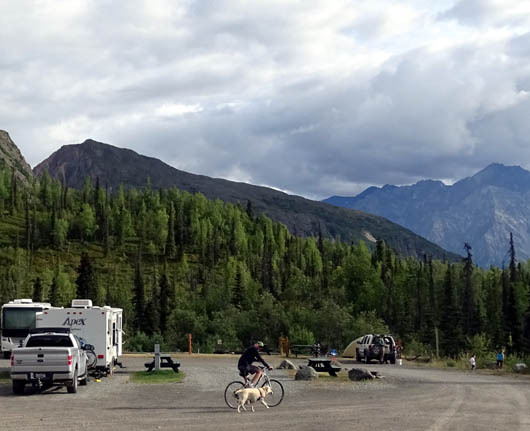 By evening the campground was mostly full, with several other Fireweed 400 riders and crews among the guests. The log building with cathedral ceiling in the dining/lounging area is very attractive. The whole place is attractively maintained and landscaped. It's also for sale, so they have a vested interest in keeping it nice. 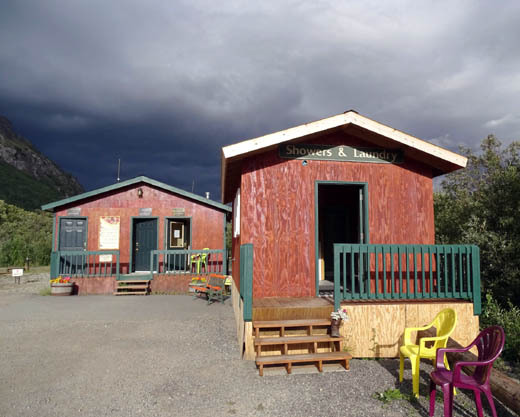 There is a restroom and laundry, plus apartments in a cabin for staff (there are no nearby towns for housing). The restaurant serves meals all day. 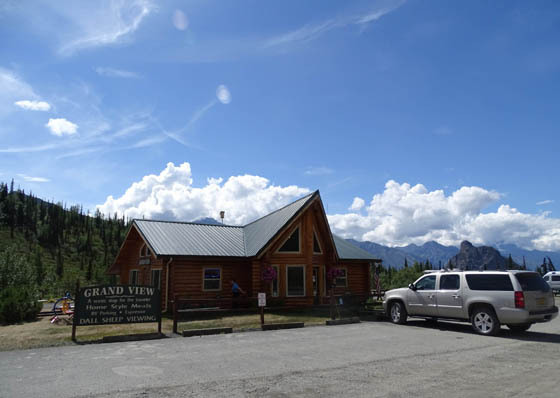 We enjoyed our stay here and highly recommend Grand View to other travelers. 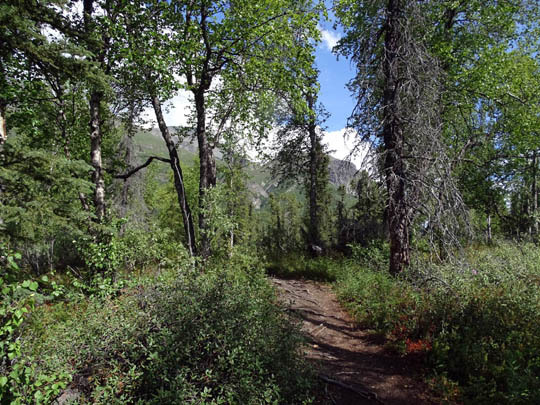 A trail to a bluff behind the campground begins on a gravel Jeep road in front of our camper. I had to see where it went, so I took Casey on a walk after we got set up and ate lunch. 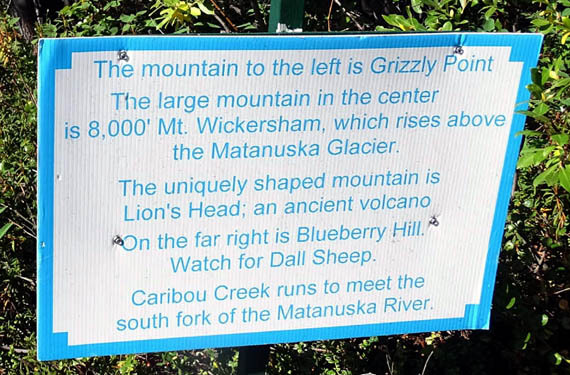 The walk was relatively short (about 1/2 mile) and easy so I called Jim to come see it. I couldn't wait to share this cool discovery! He brought Cody with him. during our stay because we never stood still long enough to look for them. 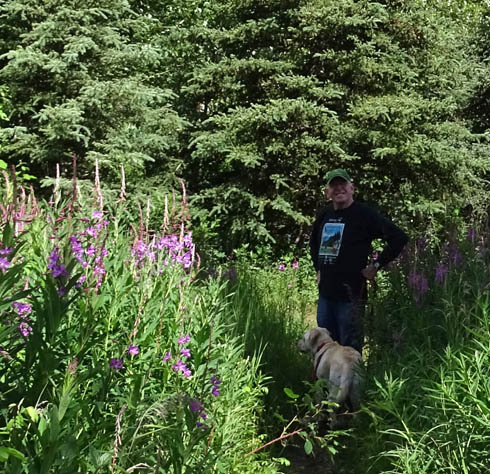 These are some tall fireweeds -- Jim is almost six feet tall. 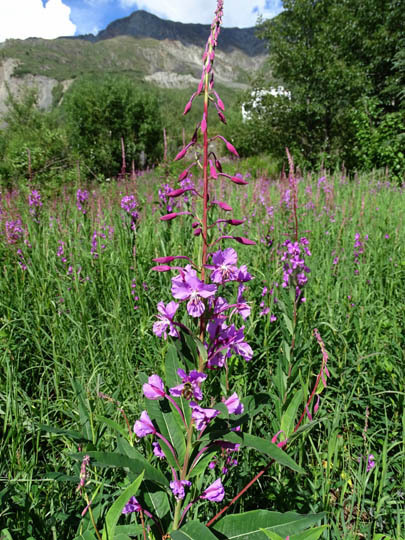 Fireweeds bloom from the bottom up and last a month or more. You can tell autumn is here when the flowers are all gone. Cool! This little trail was an unexpected bonus. I enjoyed it so much that I hiked it two more times while we were here. 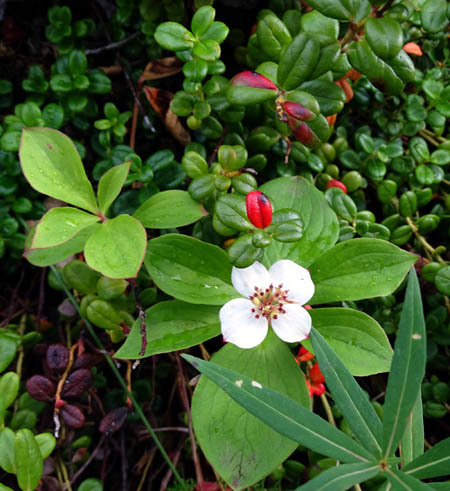 Bunchberries AKA dogwoods have pretty white flowers first, then bright red berries. 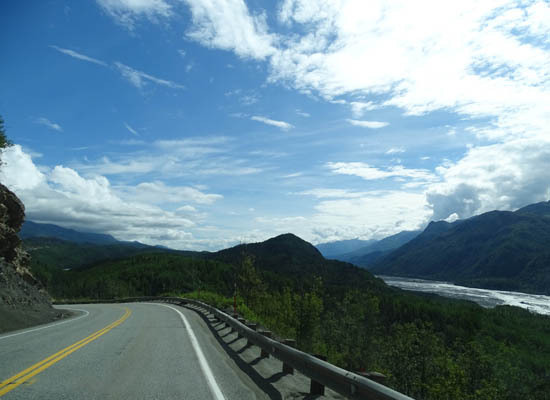 This afternoon we took two short drives in either direction from the campground. 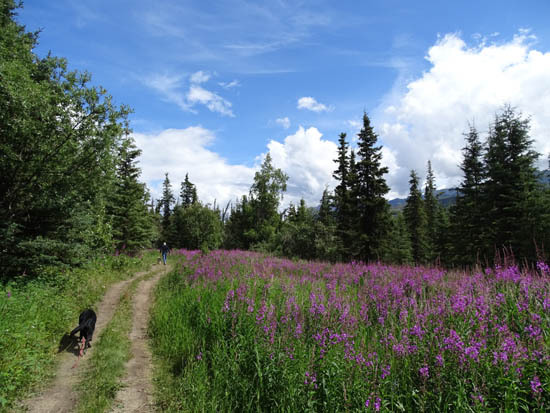 First we checked out the start/finish area for the Fireweed 400 race at the Sheep Mountain Lodge about three miles to the east. I'll include photos from there in the next entry about that event. 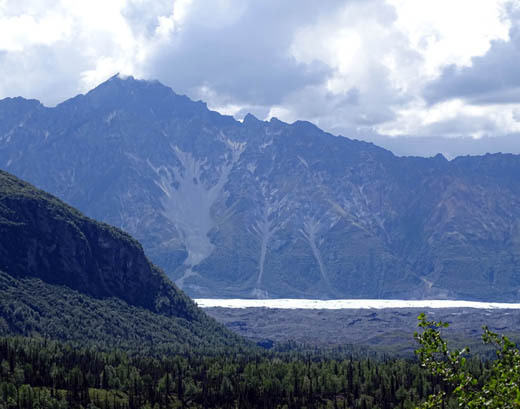 Later when Jim was getting his things ready for the race I drove nine miles back west to the Matanuska Glacier State Recreation Area to hike a loop through the forest above the glacier. 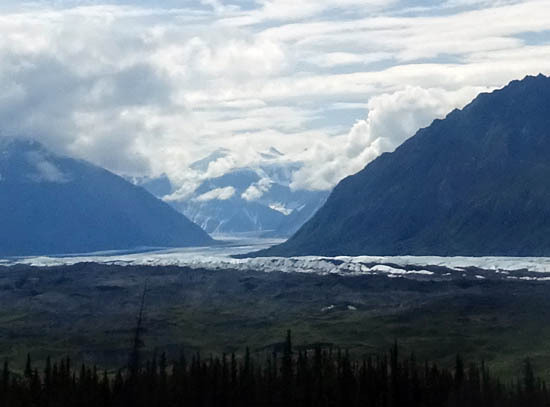 I was also able to get more pictures of the glacier and river from the Glenn Highway. 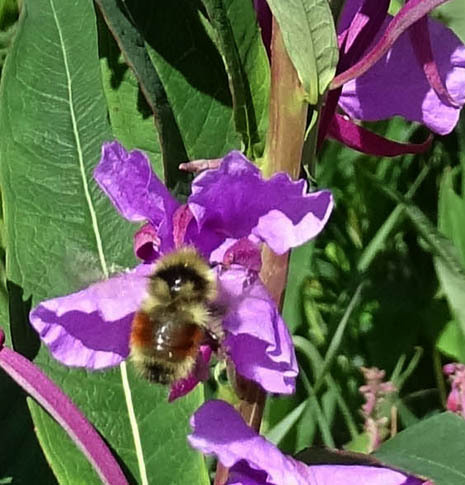 I'll include those photos in an entry dated July 12, the day after the bike race. 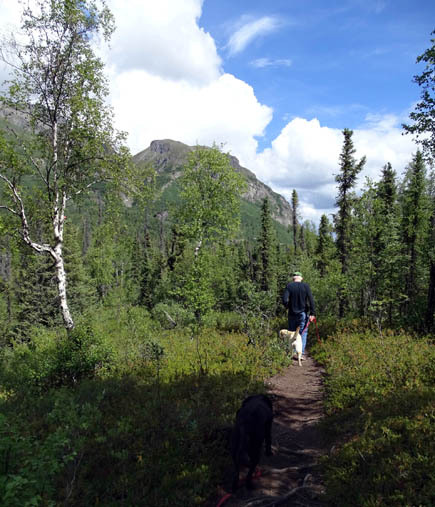 Jim and the dogs also accompanied me on the loop trail that day.